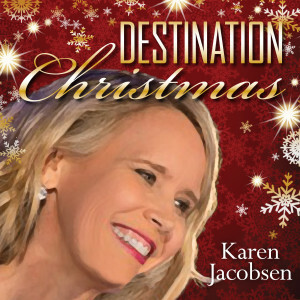 Join The GPS Girl – yes the only woman men will take directions from (lol) and get into the holiday spirit with Karen’s breathy vocals and melodic piano playing from her album Destination: Christmas. 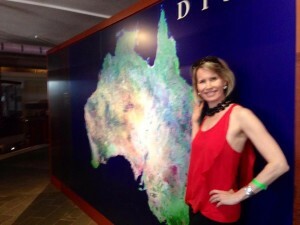 Aussie born and New York based, Karen has had wide media coverage; NBC Today Show, ABC World News Tonight, The Doctors, CBS Early Show, The New York Times, NY Daily News, Glamour magazine, one of People Magazine’s Most Intriguing People but was told she’d really made it by being a clue in The New York Times crossword puzzle! There will be prizes, surprises and we will raise funds for the extraordinary work of Worldwide Orphans Foundation. 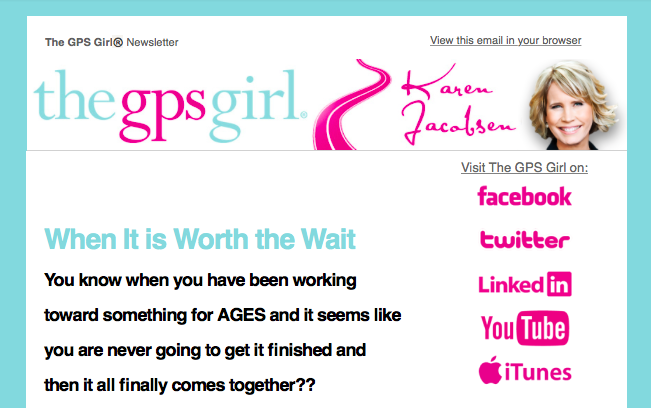 Australia’s Karen Jacobsen, The GPS Girl® is no stranger to telling people where to go and what to do. Perhaps her voice guides you every day in the GPS in your car! I know I hit the jackpot to be born and raised in North Queensland and I absolutely adore going back there and being under Australian skies. In late June and early July my schedule is taking shape for events in Brisbane, Melbourne, the Gold Coast and Toowoomba. There is still some room on my calendar, so if your organization or group is navigating change, or looking for an entertaining keynote speaker, it would be my pleasure to explore the possibilities. 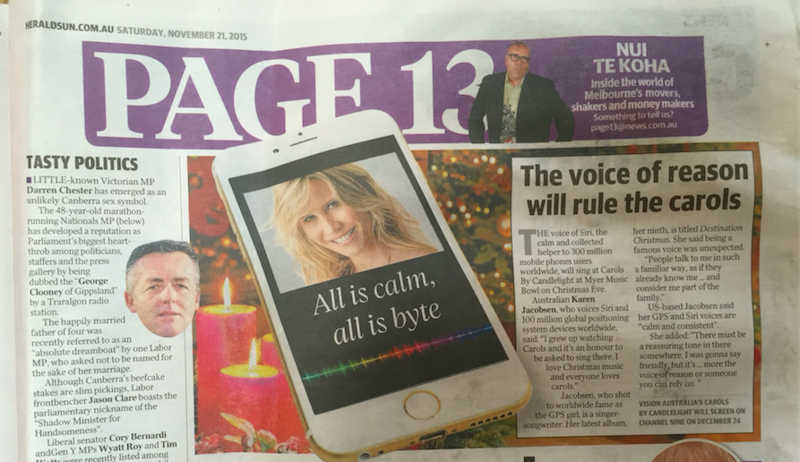 Returning to Australia for speaking, singing and media appearances is incredible. In between professional engagements I cannot wait to be connecting with friends old and new and experiencing new adventures. Performing live for over 12 000 people and a Channel Nine television audience of 2.7 million, Karen sang and played Hark the Herald Angels Sing at the Sidney Myer Music Bowl on Christmas Eve in Melbourne, Australia. Sharing the stage with John Foreman, Delta Goodrem, Dennis Walter, David Campbell, Lisa Wilkinson, Taylor Henderson, Ellie Brennan, Daryl Somers, Wilbur Wilde, Deb O’Toole, Marina Pryor, Sylvie Palladino, Anthony Callea and Jimmy Giggle, Karen was accompanied by a 60 piece orchestra and 230 voice choir. Extensive media covered the event leading up to the 78th year of the Carols, considered an institution in Melbourne, and funds raised were for the important work of Vision Australia. Karen was on the TODAY morning show in Australia. She is having a chat about all things GPS,‪#‎destinationchristmas‬ the new album and of course the big upcoming event, the Vision Australia Carols by Candlelight which will be televised live across Australia, New Zealand and Asia on Christmas Eve. Karen sings Let There Be Peace On Earth from her album “Destination Christmas” live at Stage 72 at The Triad in New York City. Let’s make this the International Anthem. The GPS Girl will sing at the Vision Australia Carols by Candlelight concert at the Sidney Myer Music Bowl on Christmas Eve. The event is attended by 12, 000 people and televised on the Nine Network to more than 2.5 million across Australia, Asia and New Zealand. For 77 years the Carols have been a part of Australia’s Christmas celebrations. 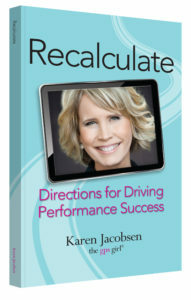 The timing could not be more perfect as Karen celebrates the release of her CD, Destination Christmas. 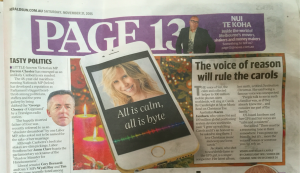 Read the announcement story in the Herald Sun. The first song from Karen’s first Christmas album, Baby’s 1st Christmas (Snowflake). Enjoy all of these gorgeous, adorable and not always cooperative babies in the music video. We would love you to join our community of people looking to Perform at their Best in business and in life. 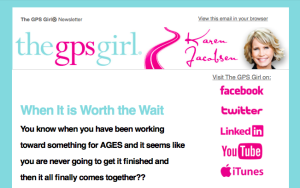 To receive our updates, information on how to #Recalculate and keep going even when things do not go as planned, subscribe on the home page (and for GREAT presents and surprises) to receive The GPS Girl’s Newsletter.